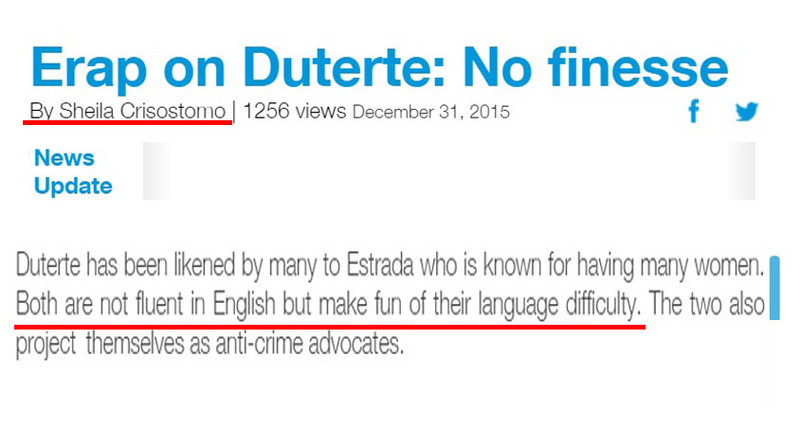 Phil Star reporter compares Duterte’s fluency in English to Erap. Do you agree with her? Mayor Joseph Estrada of Manila has angered the supporters of Mayor Duterte for calling Duterte ‘local’ and not fit to run for the Presidency. In addition, the former President accused Duterte of being a copycat. The Mayor of Manila also accused Duterte of copying his womanizing, but what sets him apart is that, he has more finesse than Duterte when it comes to women. Both are not fluent in English, but make fun of their language difficulty. You may check the screenshot below. Philstar reporter compared Duterte’s fluency in English to Erap. The news writer who wrote the controversial post is none other than Sheila Crisostomo. The response of Mayor Duterte should give his supporters something to look forward to when the Christmas break is over. What do you think about the writer’s comparison of Mayor Duterte’s proficiency in the English language to Erap Estrada? Do you think it is valid? Why would she compare president Duterte to erap in English speaking? I am 100% sure that Duterte speaks English accurately considering he is a lawyer while erap is not. You don’t have to have the American accent in order for you to be called fluent. What is important you can convey your idea effectively. Even Americans doesn’t have perfect construction of their own language. The comparison is deliberately uneducated and ignorant. How do you say a Bedan Lawyer is not proficient in English? Duterte might not have that westernized accent but he speaks English correctly compared to Erap. Maybe Shiela Crisostomo needs to enroll in an English summer class, I think she has problem in understanding English that prompted her to make such a comparison to compare a Lawyer to one who’s uneducated.. Filipinos you better use your head, think before you talk.